OVER 200 golfers are expected when the 14th Pomelo Tee Member-Guest Golf Tournament gets underway on May 1 to 4 at the Rancho Palos Verdes Golf and Country Club in Mandug, Davao City. 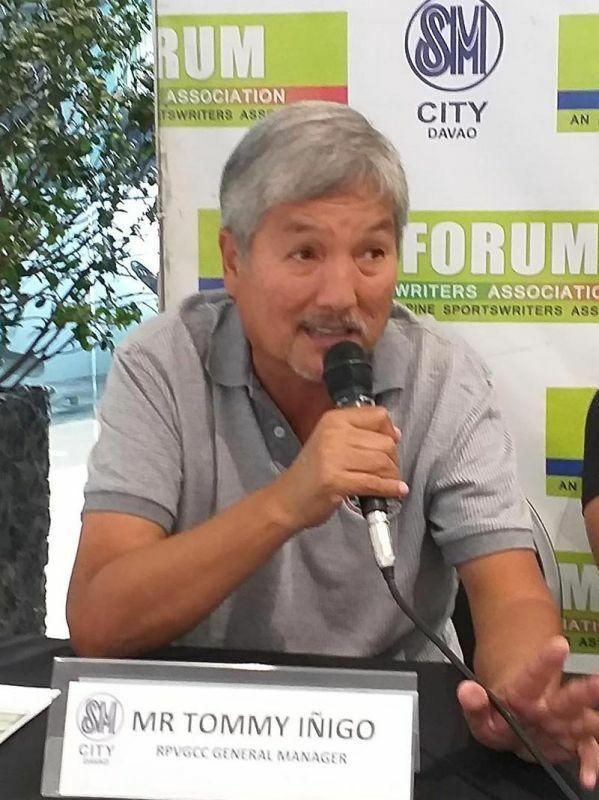 RPVGCC general manager Tomas Jose Iñigo bared this during Davao Sportswriters Association (DSA) Forum at The Annex of SM City Davao Thursday, March 28. “Mas maganda ngayon kasi maraming premyo. May Mitsubishi car from Kar Asia, Inc., P500,000 at Royal Carribean cruise for hole-in-one prizes in all par 3s. Maraming TVs at cellphones,” Iñigo said of the Modified Stableford format golfest presented by Hexat Mining Corporation, Rizal Memorial Colleges, Phoenix Pulse Technology, Mitsubishi Motors and Kar Asia, Inc. Entry fee is P6,00 inclusive of P5,000 worth of Mizuno golf card, raffle stub and free mulligan for every nine holes for two days. The proceeds of the four-day event, according to him, will benefit selected high schools in Barangays Indangan and Mandug that will receive educational equipment and other learning materials. Iñigo said, “We also support collegiate scholars in cooperation with RMC.” The scholarship is designed for selected workers and dependents of caddies. The awarding ceremonies will be held at RMC Petro Gazz Arena Davao. Registration is ongoing at RPVGCC, Apo Golf and Country Club and South Pacific Davao.